Standard sizes include 4×6, 6×9, 8×10, 8×12, 11×14, 12×18, 16×20, 18×24, 20×30, 24×30, 24×36, 26×40, 32×40, 30×45, 32×48, 36×54, 40×60, 48×72, 48×96. Custom sizing is available for ALL DuraPlaq products. See CUSTOMIZE YOUR ARTWORK for comprehensive purchase order form. Satin, Velvet, Semi-Matte and Matte. These high-quality surface finishes feature moisture resistance and ultraviolet light protection. Graphical editing, photo retouching and color profiling services available for your artwork at $130.00 per hour. Your digital signature or logo can be printed directly to your paper print (paper-to-mountable surface via digital file) or direct to surface (ink applied directly to surface). Our direct print services are available for a flat $20.00 fee, which will accommodate a 5″ x 5″ surface area. For logos and/or signatures that exceed our 5″ x 5″ surface area provision, please contact our Customer Service Team for pricing. The following edge options are available for all Standard DuraPlaq Wood Products: BLACK, BARN WOOD, ANTIQUE CHERRY, FLAG BLUE, VEGAS GOLD, GRANITE, FOREST GREEN, MIDNIGHT MARBLE, OLD TIME OAK, CUSTOM, ROCKY MTN PINE, RIVER ROCK, SILVER PLUME, TRUE RED, GALLERY WALNUT, WEDDING WHITE, RAW EDGE – UNFINISHED. Economy Wood Products feature the Black edge option only. Economy products that require an alternate edge color will be charged as a standard (Fine Art) plaque product. See EDGE COLORS for visual color samples! You may choose no hanging option (provided flat for framing), a wire hanger, an aluminum or wood cleat, security hanger and/or standoffs. Typical production turnaround is 7-10 business days. Please consider shipping timeframe(s) when calculating your deadlines for delivery date. Delivery is complimentary for our Denver, Boulder and Fort Collins regional customers. Pickup is available at our Longmont manufacturing facility or our Denver drop site locations. Residential delivery is available every Friday for a flat $60 fee. Special delivery considerations and arrangements may be applied to your order for an additional fee. Recycled, eco-friendly wood, coated with acid-free moisture resistant barrier. Velvet (Standard), Satin, Matte, and Semi-Matte. Keyhole with screw(s) and keyhole locator(s) is standard. An easel system is added to any StandardPlaq less than ten inches. Wire hanger can not be incorporated onto this product, if wire hangers are required DuraPlaq® recommends using the FloatPlaq product. Hanging Instructions for one keyhole: Included with the StandardPlaq you will have a small silver keyhole locator. Slide this into the middle of the keyhole and secure it with a small amount of tape. Hold the StandardPlaq on the space you would like it to hang. Push it against the wall having the keyhole locator make an indent where the screw should go. Screw the screw into the wall until the collar stops it. Now take the keyhole locator out of the plaq and slide the keyhole over the screw hanging it in place. Beveled with any color. Normal bevel is 3/16 of an inch, we do have the capability to do slighter bevels if requested. Multiple Keyholes: Included with the StandardPlaq you will have a multiple small silver keyhole locators. Slide these into the middle of the keyholes and secure them with a small amount of tape. Hold the StandardPlaq on the space you would like it to hang. Push it against the wall having the keyhole locators making indents where the screws should go. Screw the screws into the wall until the collar stops them. Now take the keyhole locators out of the plaque and slide the keyholes over the screws hanging it in place. For smaller StandardPlaqs under ten inches a clear dowel will be included that you can use as an easel system. At the bottom middle of the StandardPlaq will be a hole that the clear dowel can be pushed in to create the standing easel. Standard dimension pricing is shared below as our retail pricing structure. Wholesale pricing and discounts apply for business owners. To qualify for a discounted wholesale rate, we invite you to register for a business account today. Questions about our standard pricing? Contact our customer service team at +1 970.381.3421 or email us at orders@duraplaq.com. 2) Fine Art Paper Printing is NOT included in Premium Wood Product pricing. 3) When ordering the StandardPlaq, FloatPlaq or MegaPlaq please specify desired edge color. 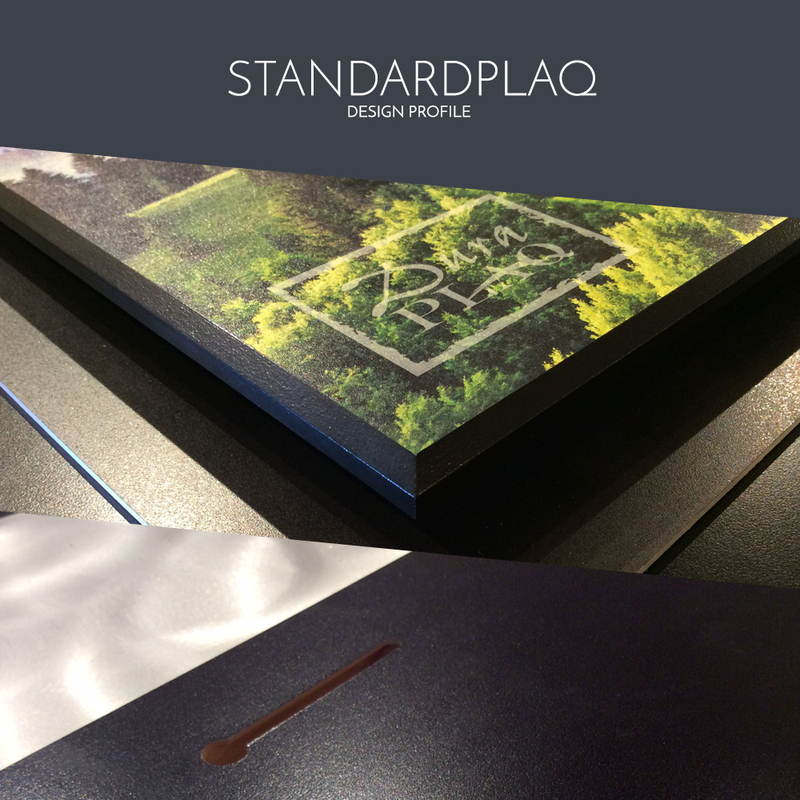 4) The Slim StandardPlaq is only available with a raw edge or with available edge color. 5) The Slim StandardPlaq does not include a hanging system (as it is typically utilized for framing). 6) The Fine Art Wood Coaster has a black edge and offers a velvet finish with a mounted paper print. Please submit image files at 4″ x 4″ size. This coaster product does not include a hanging system. Alternate edge colors are available. Popular Pick This Acid-Free Premium Quality Photo Paper Is Slightly Textured and Maintains a Luster Surface. Suitable For Most Products and Printing Needs. Exclusive Pick Meeting the Highest Fine Art Demands, Metallic Prints Add A Subtle Iridescence Sheen. Suitable For Most Products. Highly Recommended For PlexiPlaq and AlumaPlaq Products. Premium Pick Uncoated Matte Poly/Cotton Blend Canvas Tailored to Suit Premium Style. Suitable For Most Products. Most Commonly Used For the DuraWrap Product in Conjunction With a Satin Finish. Additional Papers Available Including Textured Watercolor Paper, Hahnemuhle Baryta Paper, etc. Recommended to verify color accuracy, resolution and printer output before creating a finished product. DuraPlaq does not replace products based on subjective color preferences. The DuraPlaq print processes are highly calibrated and in line with Adobe 98 color profiles. Please contact our team if you need information on calibrating your monitor for soft proofing. Recommended for proof of surface finish and overall appearance. Size will be determined based on available scrap and will not be confirmed upon placing order. Product will be imperfect and not of sellable quality. For proofing purposes only. Please contact our customer service team at +1 970.381.3421 or email us at orders@duraplaq.com if you have any questions, comments or concerns when placing your order. For the best resolution and end product, please submit image files in 8 or 16 bit format using Adobe 98. For optimal print resolution, files should maintain 300 or 600 dpi at the desired print size, in tiff, jpeg, psd, or psb format. Please make sure your artwork reflects the required image file dimensions for our preset dimension products. If you need to display a custom print or presentation style, please feel free to contact our team to discuss your design needs! Artwork that is subject to beveled edging can reduce your artwork dimensions up to 1/4″ from each side. Placement of your signature or crucial image composition should placed at a minimum of 1/4″ away from this trim margin. Please review our Terms and Conditions for additional details regarding image resolution, customization, applicable fees and more. Due to the nature of printing to materials with varying base colors, textures and finishes, there may be variations in the surface and overall appearance of a direct or infused print. Inks and end product quality are not guaranteed with customer provided materials due to varying ink transfer and adherence of materials. We do not offer replacements on customer provided materials or prints if end product does not meet customer expectations. Every DuraPlaq product is developed and designed with durability and ease of care as one of our core objectives. Our products are delivered with the highest quality standards in preservation and protection, tailored to illuminate your artwork’s color and luster throughout its life cycle. DuraPlaq products are primarily designed for indoor use, ideal in low to moderate humidity. To maintain your product’s longevity, it is not recommended to display artwork in prolonged, direct sunlight, or store in environments over 150 degrees Fahrenheit. Ammonia-free glass cleaner and a clean cloth are recommended for the general cleaning of a DuraPlaq products. For best results, … spray glass cleaner on a clean, soft cloth (prevent over-spraying and streaking on the surface), and wipe-down a plaque with gentle, circular motions. Many surface finishes will allow for heavier grease or debris removal using additional cleaning products (noted below); varying per surface finish. Please do not use ammonia or acetone-based cleaning products. These chemicals dramatically reduce the longevity and durability of our protective finishes. DuraPlaq surface finishes protect and preserve artwork with a durable, UV-protective and water resistant finishes. Satin Finish is DuraPlaq highest gloss finish. Products that feature our Satin Surface Finish includes a complimentary Novus® Fine Scratch Remover and Novus® Plastic Clean & Shine packs. These products (found in your hardware pillow pack) can be used to buff-out hairline scratches. 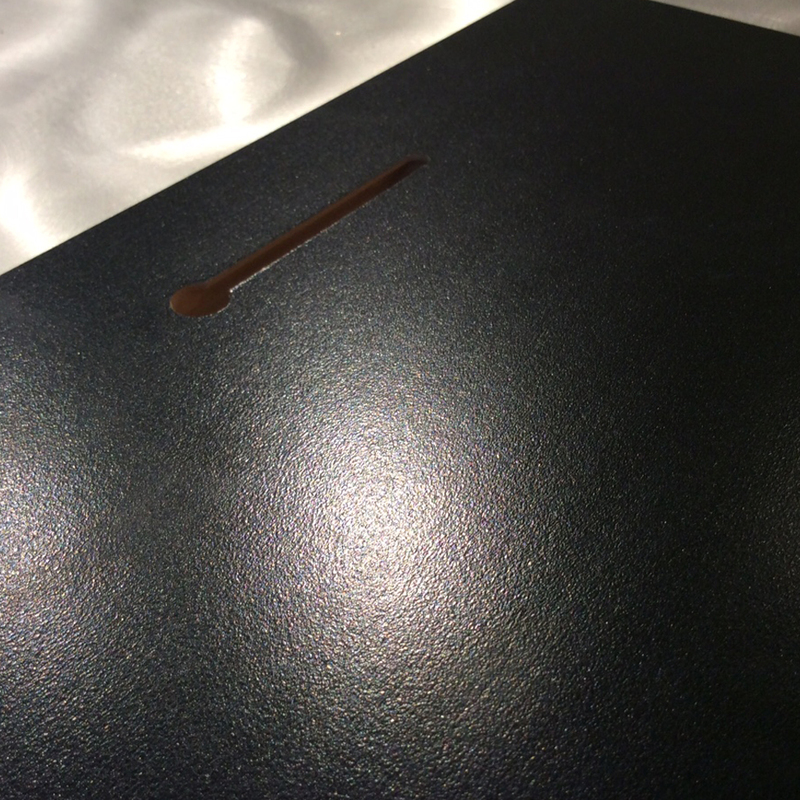 DuraPlaq applies Novus® polishes to our Satin surface finishes before packaging the finished piece. Satin Finish yields a moisture-resistant and UV-protected finish; it can be used indoors even in high humidity environments. Even with the durable and UV protective satin finish, it is not recommend to hang artwork in prolonged direct sunlight or leave in heat over 150 degrees Fahrenheit. Velvet Finish is DuraPlaq’s most durable surface coating. This finish has a slight texture that protects from scratches and other damage. As a high durability finish, it is most popular in high traffic and commercial environments. To clean Velvet Finish, we recommend using ammonia-free glass cleaner in conjunction with a clean cotton or micro fiber cloth. Velvet Finish is a moisture-resistant and UV-protected finish and can be used indoors–even in high humidity environments. Even with UV protection we don’t recommend hanging artwork in prolonged direct sunlight. Please do not leave this surface finish in prolonged heat over 150 degrees Fahrenheit. To remove heavier grease (fingerprints) or debris, Isopropyl or Denatured Alcohol may be used for cleaning. Matte and Semi-Matte Finishes can be cleaned with ammonia free glass cleaner and a clean cotton or micro fiber cloth. You may also us Isopropyl or Denatured Alcohol to remove heaver grease or debris. These are moisture resistant and UV protected finishes. It can be used indoors even in high humidity environments. Even with UV protection we don’t recommend hanging artwork in prolonged direct sunlight. Please do not leave this surface finish in prolonged heat over 150 degrees Fahrenheit. Direct prints have a UV and water-resistant protection integrated within the ink, eliminating the need for added surface protection upon application. These prints are resilient to UV light and can be used in strenuous environmental conditions, such as direct sunlight–even usage in the seasonal outdoors. Please note that during cleaning some residual ink may show on the cloth during the first couple cleans. DuraPlaq does not recommend the use of denatured alcohol or acetone in the cleaning of these products. Frames come in many different varieties and finishes. DuraPlaq recommends using only ammonia free glass cleaner and micro fiber or cotton cloths to clean these products. Water and moisture should be removed immediately as most frames are constructed of wood, which can be adversely affected by prolonged exposure to moisture. DuraPlaq glass products are best cleaned with an ammonia free glass cleaner and micro fiber or cotton cloths. Spraying on the cloth will prevent over spraying. Using round circular motions work well to prevent streaks. If the glass you purchased is UV protected it can be used in UV light areas. Even with UV protection we don’t recommend hanging artwork in prolonged direct sunlight. DuraPlaq Plexi products can be clean easily with an ammonia free glass cleaner and micro fiber or cotton cloths. Spraying on the cloth will prevent over spraying. Using round circular motions work well to prevent streaks. DuraPlaqs normal Plexi products are UV protected and have an added scratch protection on the surface. This prevents hairline scratches from occurring during cleaning. Even with UV protection we don’t recommend hanging artwork in prolonged direct sunlight. Please do not leave Plexi products in prolonged heat over 150 degrees Fahrenheit.